A horizontal axis wind turbine. To build a wind turbine, several blades must be attached to a rotating motor and mounted at a height that allows the device to spin in the wind. This type of project may be completed by a do it yourself handyman with an intermediate skill level. The finished product, when connected to a battery storage system and a controller, may be used to convert wind energy into electricity. Individuals who prefer not to construct this type of device personally, but are interested in wind power, may wish to visit green energy websites online that provide kits and contact information for local contractors who can install small turbines. The parts required to build a wind turbine include a generator, spinning blades, a tail paddle piece, and a mounting pole. The generator may be constructed from any type of small rotating motor. This piece of machinery converts the rotations of the blades into usable electricity. The motor should be able to create at least 12 volts of energy from a relatively low rotation per minute (RPM) speed. Motors which require several thousand RPMs to function are not appropriate for this type of project because it is unlikely that any wind force can move the blades at such speeds. The spinning blades that generate the electricity should be made from a hard, durable material. ABS piping, which is a hardened type of plastic resin, is a common material used to build a wind turbine. The piping can be cut down to a length between 19 and 24 inches (48 and 61 centimeters) and then cut lengthwise into four quartered sections. These sections can be shaped with a belt sander so that they angle down the long edge of the pipe until they come to a blunt point at one end. Once the blades have been shaped, they can be attached to the generator. This may be done using any type of bolting mechanism that will support the weight of the blades while allowing them to spin freely in the wind and interact with the motor. The generator and blades can be mounted onto any type of flat support, such as a long plank of wood. The opposite end from where the motor is mounted should feature a flat paddle-like piece which will turn the entire mount into the wind and allow the blades to spin at their maximum speed. To build a wind turbine which will generate a small amount of electricity, the blade and motor mechanism must be placed at a height which will receive uninterrupted wind. This may be accomplished by building a tower or flag pole type of structure to which the motor may be attached. The final assembly must be able to turn freely with the current of the wind. The turbine must also be connected to a battery supply and a controller, which will act as storage for the electricity generated by the unit. This requires some minor electrical wiring to complete. What is a Wind Turbine Farm? 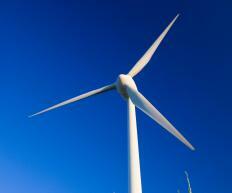 What Should I Consider When Buying a Home Wind Turbine? @Feryll - In general, solar energy is a better option than wind energy for the average home. My family uses solar energy since we have more sun than we have wind during the year. However, on those cloudy windy days, I always think we should really be using wind energy. This is why we are planning to build a wind turbine or two. We live in the country and have plenty of space, and we think the wind and the solar energy will complement one another very well. @Feryll - Unless you live in a location with constant wind speeds at a certain level you aren't going to see much return on your investment in a wind turbine. However, if you just like the idea of having one and promoting green consciousness then definitely build one yourself, and save some money on the cost of installation. My friend bought one and the thing never lived up to what the dealer said it would do. Most dealers are going to inflate the productivity of the wind turbines because they are trying to make a sale. Be sure to get an accurate report of the average wind speeds where you live to determine if you can benefit from installing a wind turbine. A few really windy days or even a couple of windy months is not enough to justify the purchase of a wind turbine. We are considering building a wind turbine. There are not many days during the year when we don't have some measurable amount of wind. During the winter, fall and spring we have consistent breezes and heavy gusts. For this reason, we think we might be missing out on a great energy/money saver by not having some type of wind harnessing system. However, I don't know how the wind we see as substantial would translate into actual savings. How much energy production can be expected from a wind turbine we build in our back yard?